Looking for an innovative professional IoT solution!? Smart cities, sensors, security, media, consumer products, beacons, RFID, NFC, we have done it all. 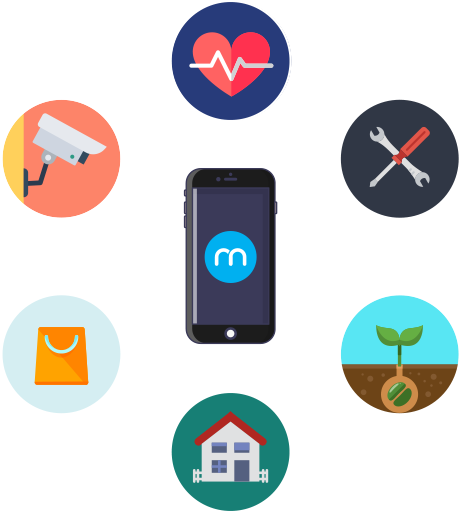 moblers holds an extensive experience with IoT development to various partners and using cutting-edge technologies. The combination of innovative spirit with the perspective we hold of the related technologies enabled us to provide unique solutions to challenging requirements. The IoT solutions market offers many standalone products and ready systems but if you are a company that needs a dedicated solution, use proprietary mechanisms, or a start-up looking to develop your own product, you need an experienced partner to implement a tailor-made solution just like we do. With the fast-paced environment of this technology landscape, we are confident in our ability to deliver stellar solutions. We worked with internal personnel as sub-contractors for specific components, as part of a group of vendors, and as lead integrators who manage the development of a large scale solution. We are very comfortable with working on the implementation of IoT-based solutions for start-up companies, integrators, and enterprise companies. Smart home – we are able to implement security solutions, home appliances, consumer electronics, media-related projects, smart home control and management, and any other aspect of the smart home ecosystem. Sensors – implement the software aspects of specific sensors, multi-sensor systems, or dedicated sensors-based products for data collection. The standalone sensors solutions can solve problems in security, telemedicine, environment, science, chemistry, manufacturing, shipping, Agritech and more. Smart cities – intelligent city systems for infrastructure automation and reporting, services aimed at residents and tourists, intelligent traffic and parking solutions, security systems, and IoT security solutions to protect the IoT infrastructure. Municipalities and local governments can use IoT for enforcement purposes and to collect data that enables other big-data solutions. IoT management and control systems – the growing need to manage and control the variety of deployed IoT based sensors and systems increases the need for a management and control system with the ability to collect data collectively, share data, monitor sensors and systems health and security. The management system enables remote updates and automatic decision making based on live data. Beacons – connecting physical and online with contextual triggers and information. Smart apps based on smart devices, location, and context. Beacons based solutions can fuel indoor navigation, manufacturing, businesses, information services, smart advertisement, retail solutions, entertainment, and security. Wearable – dedicated wearable devices or devices incorporated in existing clothes or accessories that enable the sensing or manipulation of body functions. Telemedicine and sports applications are usually the most relevant implementations using wearable technology. Smart consumer electronics – connected devices with the ability to report and receive commands. While most current smart-home applications relate to security, there are devices that serve as smart toys, education, media and entertainment, gardening, intelligent pet solutions and more. Our work to develop omnichannel retail solutions resulted in a comprehensive indoor navigation solution for malls. We used several contextual indicators including sensors and beacons to provide an improved shopping experience. During our work on Agritech solutions, we implemented sensors-based intelligent systems for homes and large-scale farms. The sensors based decision-making apps we created assist the smart packaging and shipping industries. The IoT control center we develop is used by large organizations including corporate and government. Other solutions include blockchain based supply chain management systems that include an end to end intelligent components. We implemented IoT smart home devices and consumer products, intelligent warehouse, automated delivery management system, and more.